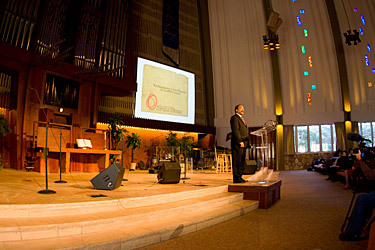 In its annual Martin Luther King Jr. memorial colloquy, Pacific Union College celebrated the legacy of this civil rights leader in several ways on January 14, 2010. PUC president Dr. Heather Knight opened with a brief background on Dr. King and thoughts on his legacy, which influences our own campus as a "dynamic multicultural learning community," she said. "We owe a lot to Dr. King." She also shared a little-known fact about King's name: His father was named Michael Luther King and named his son Michael Luther King Jr. After a family trip to Germany, the family was so impressed by the life and legacy of Martin Luther that King's father changed both his and his son's names to Martin. The program featured several beautiful and energetic songs from a recently formed PUC gospel choir, who, said Dr. Knight in her intro, "are truly embodying our living out of the 'Beloved Community' here on campus." One of their songs, "Bless Me (Prayer of Jabez)," was dedicated to those suffering from the recent earthquake in Haiti. Dr. Norman Knight, PUC's outreach chaplain, delivered a sermon – "a message that I believe Martin Luther King would bring to college students today." He addressed the postmodern world in which students find themselves today, a world in which the "technological means and morals by which we live have outpaced the spiritual ends for which we live." Emphasizing that people and institutions will fail when they are preoccupied with secondary things, with things that are "unrelated to forming a close personal relationship with Jesus," he talked about the importance of realizing when we have been traveling without Jesus, and going back to find Him before we press on. "The time you have here at this wonderful God-ordained college is not just to acquire skills so you can ply your particular trade when you leave here," he told students. "It's also for you to form or solidify a close personal love relationship with Jesus so you can become citizens of the kingdom of God. Pacific Union College should be a launching pad for the kingdom of God."